Motorcycles, guns, monsters and bikini-babes. 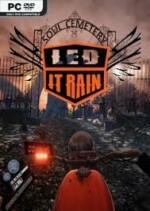 Led It Rain is first person shooter motorcycle driving racing game. Faster you drive and shoot monsters more score you obtain. Monsters include zombies, devils, skeletons, werewolves, chainsaw-maniacs and hilarious Wheelchair Zombiesᵀᴹ. Each race track has three laps on such levels as Depot, Crypt, Abyss, Mansion and Swamp. Led It Rain features music by Electric Deathbeat and a theme song by Maze of Jesse Lane.